Ever wonder how Mexican cuisine features in a foreign culture such as….say, Japan? During my brief stint in Tokyo, I was craving a taste of my favorite cuisine from home. Waiters in cowboy hats? Sounds fun. 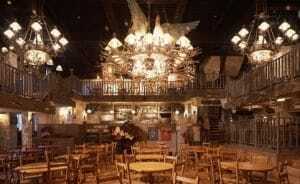 First step into the restaurant and you feel like you’ve stepped into a strange Spaghetti Western. The decor was pretty impressive, with tall, antler decorated (I think those were antlers) chandeliers and rustic wood railing everywhere. The menu was eclectic. Beef Jambalaya, Buffalo Chicken Wings, Enchiladas, Taco Rice. I’m not sure when Beef Jambalaya counted as Tex-Mex food, but okay. I ordered the enchiladas, and some “Fresh Guacamole” as a starter. The guacamole came, and surprisingly, it was decent. The enchiladas would not have passed muster back in San Diego, but after having no Mexican food for the past two months of travel, they hit the spot. Even if it weren’t for the awful dollar-to-yen exchange rate, Japan is expensive. So, it’s not surprising that a cuisine as rare as Mexican would be super-expensive, though the price tag was still a shock given Gustavo’s no-true-taco-should-cost-more-than-a-buck maxim. Two beef tacos clocked in at 840 yen, which, Google says at press time, is $9.85. A burrito combo meal? $20.99. Did I spot images of guys in giant sombreros, sleeping under a saguaro? I did. El Pancho actually occupied a pretty cool space above ground level in a Shinsaibashi skyscraper, a dimly-lit, cantina-of-comic-books room. There are Mexican flags, maracas, and, more than anything, lots of cactus-related paraphernalia. All of this may be played out to our eyes, but keep in mind this kind of imagery is awfully foreign in Japan. One lady we dined with–not Japanese but not American–asked what a taco actually was. We’re spoiled in OC. I half-expected nothing but corn-and-mayonnaise burritos and pickled ginger tacos from Japanese chefs taking on Mexican food, but instead the differences with the homeland’s–or at least Southern California’s–cuisine were more subtle. The chips and salsa portion was dinky, a far cry from the hefty and constantly replenished baskets of obese America. The burrito combo came with not beans and rice but rather beans, a quesadilla, a taquito, grainy mashed potatos and yes, corn. Rice was nowhere to be seen on the plate, which is a shock given that Japan loves its rice–white rice.